It’s coming. You can’t avoid it. You can just prepare. The end of summer is fast approaching, and while some of us (cough, San Francisco) have a late “Indian Summer” to look forward to, most of the nation will have to pack up those grills and enter the fall season. Give your grill a proper goodbye, for now… These fun little Grilled Avocado Tacos have a deliciously fresh combination of flavors that might just inspire a summer fiesta! 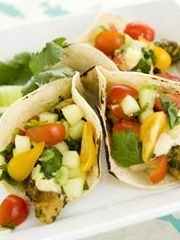 For a seafood twist, try our Little Fish Tacos with Tomato Salad and Chipotle-Lime Crema! You can find these featured at our upcoming Date Night Couples Cooking Class in San Francisco! 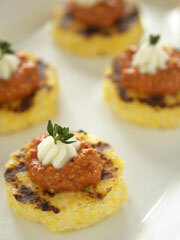 This recipe and others like it can be found in our Appetizer Recipes Library! Marinade: Put cilantro, paprika, cumin, chili, lime zest, lime juice, olive oil and salt in a blender and process to a paste. Halve, pit and peel the avocados. Place avocado halves in a bowl and gently coat avocados with the marinade (do not mash the avocado in any way). 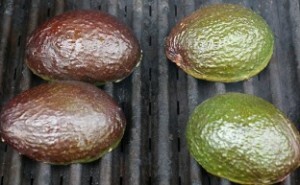 Grill Avocados: Heat a ridged grill pan over high heat. Place each half on the grill for cook for about 30 to 45 seconds. Don’t be afraid to take the cooking outdoors, instead, and grill the avocados for a bit longer. Cut Avocados: Transfer grilled avocado to a cutting board and cut each avocado half into thin wedges, about 4 wedges per half. Assemble Tacos: Place a piece of avocado on each tortilla. Put a dollop of the crema on the avocado then top with a spoonful of tomato salad. Garnish with some cilantro, roll into a cone and secure with a toothpick. Serve on a platter with lime wedges.